There’s a schism in design philosophy between titles that fall under the same generic umbrella, and it’s important to identify what’s important to a given fighting game. Are they trying to be flashy or functional? Often times, it’s very difficult to achieve both. What about rewarding meticulous play versus risk-taking? Should newcomers be intimidated, or should a fighting game be difficult to learn, catering to an already devoted genre fanbase? My Hero One’s Justice is not, by any stretch of the imagination, a game that will set the fighting world on fire. What it is, however, is a game that is a loving adaptation of some of the qualities that make My Hero Academia such a joy to watch or read. 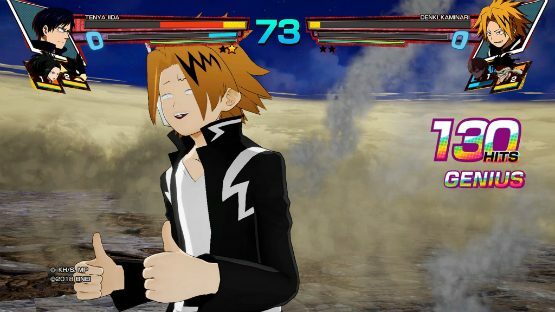 Thanks to an enjoyable integration of anime-style visuals into a honed, if not relatively standard fighting engine, My Hero One’s Justice is the perfect multiplayer fighter to be shared among fans of its inspiration—just don’t expect to be moved in the same way you would if you were watching Deku and Bakugo grow together during an episode of the anime. Bandai Namco surely knew that My Hero One’s Justice was going to be scrutinized. The game’s anime counterpart is a runaway smash hit, with a successful first movie adaptation in the books and a fourth season on the horizon. For the most part, My Hero One’s Justice doesn’t buckle under the weight of those great expectations, although it doesn’t do much to separate itself from other anime-inspired fighting titles that we’ve seen in the past. In some ways, that’s a good thing. Case in point: My Hero One’s Justice, like many of the anime fighters that have come before it, has absolutely nailed its visual design. Characters like Fumikage Tokoyami and Tomura Shigaraki pop off the screen, oozing the qualities that have made them such popular characters in the franchise. The environmental design is spot-on as well, featuring some of the most famous areas explored in the anime up to this point. The environments are pretty dynamic, featuring a multitude of destructive changes caused by missed attacks or the ricochets of villains off of structures. The maps are also horizontal and vertical, and will shift to wall combat if the battle takes it there, making them even deeper than they initially appear. Another welcome element is the game’s extremely generous rewards system, which allows players to earn coins based on fights to unlock character customization and outfit changes. After just a few hours completing some of the initial story mode campaign and a few fights with friends, I had already earned enough to purchase a couple different outfit additions or changes for my favorite character. While the costumes are mostly palette swaps, especially for the less central characters, it’s refreshing to find them locked behind a system that simply rewards people for playing the game rather than paying extra. One of the most endearing qualities of My Hero Academia is the way the property devotes so much time to all of its characters. That’s a tall order, given that the cast is constantly expanding, but somehow the anime and manga manage to do it all the same. My Hero One’s Justice isn’t quite as good as its counterparts in that regard, featuring what feels like a bit of a small roster despite having twenty characters available to play right from the get-go. Especially with a property that has done such a great job at giving almost all of its extensive character roster some depth, that does feel like a bit of a missed opportunity. Once you select a character and two teammates, though, My Hero One’s Justice hits its stride. Each character feels pretty different from the rest, and they’ve been very deliberately designed to mimic their anime counterparts. Shigaraki, for instance, is a little slower but punishes opponents who get too close with decay-themed AoE and strikes. Todoroki excels at most aspects of combat but never stakes a claim to being the best at any of them, just like his well-rounded persona and approach in the show would support. Support characters use powers that are synonymous with them and add a bit of strategic depth, offering different attacks and control elements into combat before it even begins. The fights themselves are also a blast. It’s rare these days that, from the start, a game’s roster of fighters feels balanced—and I could certainly be missing something a more skilled player would notice—but My Hero One’s Justice feels pretty fair for all of its characters. There was nothing particularly punishing about choosing any of them over the My Hero Academia universe’s established best, and that freedom of choice is crucial in the enjoyment of the game’s multiplayer. 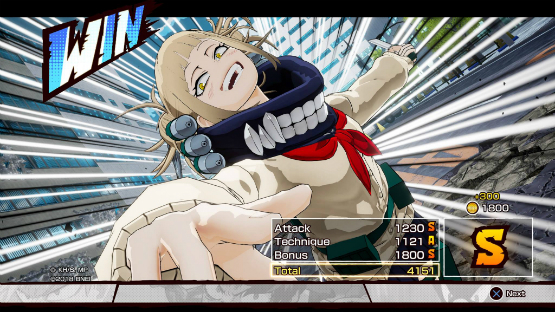 Arcade mode is an enjoyable jaunt down a few different “what if?” paths for each character, and although the dialogue isn’t much for some of them, it’s all icing on the cake of what is a delectable My Hero Academia experience—outside of one thing that drags the game down slightly. All of these elements add up to an enjoyable fighting game that does right by its license. The issue, though, is that My Hero One’s Justice just misses the mark when it comes to capturing the essence of what makes My Hero Academia such an enjoyable series. The game’s story campaign is a retread of the story beats players have already experienced, and they’re captured without any of the heart and soul that made them such heart-wrenching moments within the manga or anime. Part of that can be attributed to being in a different medium, and even the genre of game My Hero One’s Justice is. But not all of it the blame can be laid at the feet of the adaptation process, and it’s unfortunate that My Hero One’s Justice is good, because it constantly teases the player with chances to be great. The story mode is too simplistic and absent for any real emotion to be considered a strong addition to the game’s features. Given the license the game is using, it’s an egregious error that is bigger here than it would be in other potential adaptations. It’s not that it’s unplayable—far from it, it’s actually quite decent—but that something that should be easily one of the game’s bigger strengths is instead just another feature. Overall, though, it’s tough not to recommend My Hero One’s Justice all the same. Being able to take these characters out for a spin and re-enact some of their most memorable moments from the story is a treat, and the fighting gameplay itself is just strong enough that it keeps drawing me back in whenever I think I’m done with it for the next few days. It’s a solid game that can easily draw in newcomers as well, thanks to the story mode’s careful retreading of past plots, too. My Hero One’s Justice is a strong introduction to what could easily be the foundation of a valuable fighting franchise for Bandai Namco and a must-own for My Hero Academia fans. My Hero One’s Justice review code provided by publisher. Version 1.00 reviewed on a PlayStation 4 Pro. For more information on scoring please see our review policy.